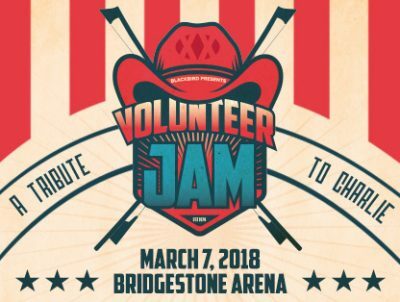 This year’s Volunteer Jam on Wednesday, March 7th, 2018 / Bridgestone Arena, Nashville TN is a tribute to music legend Charlie Daniels. Since 1974, Volunteer Jam has brought together some of music’s greatest performers. Now, 43 years later, friends, fans, and an extraordinary lineup of musicians will come together for a very special night honoring music legend Charlie Daniels. Included in the lineup are two IROCKU musicians- ours truly Chuck Leavell and Peter Keys, keyboardist with the Lynyrd Skynryd band. This unforgettable concert event will feature performances by Charlie Daniels and The Charlie Daniels Band, ALABAMA, Alison Krauss, Billy F Gibbons of ZZ Top, Blackberry Smoke, Bobby Bare, Chris Janson, Chris Young, Chuck Leavell, Eddie Montgomery of Montgomery Gentry, Jamey Johnson, Justin Moore, Lee Brice, Ricky Skaggs, Sara Evans, The Oak Ridge Boys, Travis Tritt and many special guests to be announced in the coming weeks.